Captain Bouncer Smith is experienced in every aspect of the sport of fishing, in South Florida as well as a variety of ports throughout North America, he has devoted his life to sharing fishing with others, through his radio shows, magazine articles, seminars, and on the water. Bouncer has been running boats out of South Florida since he was 19, working on them since he was 15. He shares his love of the ocean and fishing with children and adults from the novice fisherman to the tournament sportsfisherman. He loves all the excitement of catching bait to monster tarpon and marlin. He has been captain of many Tournament fishing teams and can arrange one of those opportunities for you, if you wish. This is the man to take you on a day of fishing you have always dreamed of. E-mail Captain Bouncer today. 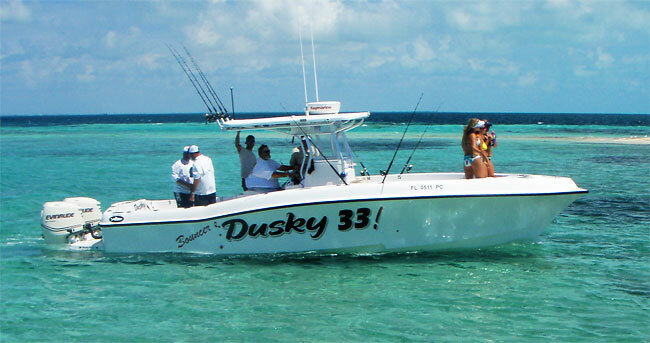 Bouncers Dusky 33 is located 200 yards from the inlet, 5 minutes from dock to tarpon, 10 minutes to the sailfish. Bouncer's Dusky is a modern 33 foot Dusky with a crew of two. Carrying up to 4 passengers and is a boat styled for South Florida fishing pleasure. The boat, powered by Evinrude E-Tec 300s, is equipped with Simrad color Fish Finder, GPS/Chart plotter and VHF radio, all prudent safety equipment and enough Penn tackle to stock a large tackle shop. On board are 8,12, 20, 50 and 80 pound outfits plus a couple fly rods ready for every game fish. Of course all the terminal tackle you could ever need is aboard. 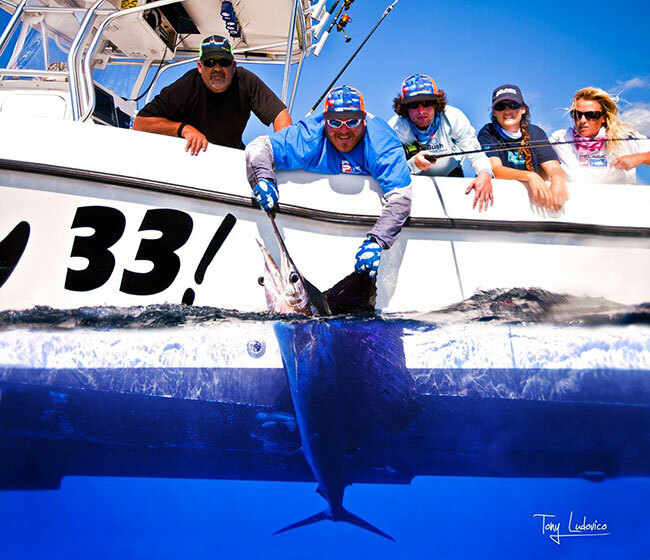 South Florida offers great fishing for tarpon, sailfish and swordfish. We also catch plenty of kingfish, dolphin (mahi –mahi), tuna, barracuda, cobia, snook, shark, snapper, grouper, assorted jacks, bonito, and the list goes on and on. Now the details, we carry a maximum of 4 people. We run 8 hour trips, specialty trips to the Bahamas and daytime or nighttime trips for swordfish. Please cruise through our fishing season’s list and see what’s your dream trip, and feel free to call and ask any question that comes to mind. Don't forget to checkout SwordFishMiami.com.